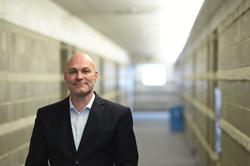 The new dean at SLCC was the first director of InnovaBio at the college's Jordan Campus. Salt Lake Community College recently named Craig Caldwell as the new dean over its School of Science, Mathematics and Engineering. Caldwell joined SLCC in 2005 as the first director of the College’s InnovaBio program. InnovaBio uses experienced scientists and student interns to help corporations develop new products or explore new ideas in a state-of-the-art biotechnology lab at SLCC’s Jordan Campus. From 2007 to 2014 Caldwell served as the chair and director of SLCC’s Biotechnology program, during which time he developed the Associate of Science Biotech transfer degree and the Biotech Baccalaureate degree partnership with Utah Valley University. Caldwell has also led the Biotechnology program’s success in grant procurement as a lead writer, principal investigator and administrator for several major grants and contracts from the National Science Foundation, Department of Labor and Department of Education. Caldwell received his Bachelor of Science in Biology from the University of Louisiana and his Ph.D. in Biochemistry from Texas A&M University. He brings an impressive record of innovation, partnership and leadership to his new role.